Below is a 5-question test on finding the volume of a sphere. This test is linked to the lesson on finding the volume of a sphere, which also has a test. Who Discovered How to Find the Volume of a Sphere? How to find the volume of a sphere was first discovered by Archimedes. 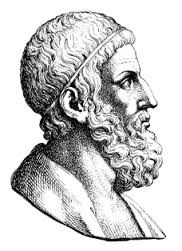 Archimedes also discovered how levers work, created a screw pump, and designed "siege engines" (including a heat ray which focussed the Sun to burn enemy ships!). He famously shouted "Eureka! ", leaping out of his bath, having discovered that you displace your own volume in water when you get into a bath.